On October 11, 2018, the BPS Board of Education approved two resolutions (below) authorizing the annual school board election for 2019. The BPS Board has two seats open for candidacy in 2019 - District 3, which has a four-year unexpired term of office, and district 4, which has a five year term of office. Candidates interested in filing to run for one of these seats may file a Declaration of Candidacy Form at the Tulsa County Election Board at 555 North Denver in downtown Tulsa. The office hours are 8 a.m. to 5 p.m. Monday through Friday. Filing period is from December 3 through December 5, 2018. Detailed information is available for download HERE. 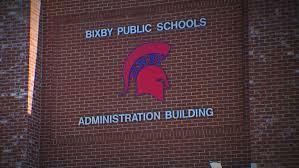 Discussion, consideration and vote to approve or not to approve a resolution of the Bixby Board of Education to the Tulsa County Election Board calling for an annual school board election of member of Board of Education office, Number 3, which has a four-year unexpired term of office. Primary Election to be held at the regular voting places within Bixby School District on the 12th day of February, 2019, only if three or more candidates file for the position. General Election shall be held on April 2, 2019, under the following circumstances: if only two candidates file for the position scheduled to be on the ballot or for a position on the ballot for an unexpired term or if no candidates in the Board of Education Primary Election receives more than 50% of the votes cast. The polling places shall be open from 7:00 a.m. to 7:00 p.m. Discussion, consideration and vote to approve or not to approve a resolution of the Bixby Board of Education to the Tulsa County Election Board calling for an annual school board election of member of Board of Education office, Number 4, which has a five-year term of office. Primary Election to be held at the regular voting places within Bixby School District on the 12th day of February, 2019, only if three or more candidates file for the position. General Election shall be held on April 2, 2019, under the following circumstances: if only two candidates file for the position scheduled to be on the ballot or for a position on the ballot for an unexpired term or if no candidates in the Board of Education Primary Election receives more than 50% of the votes cast. The polling places shall be open from 7:00 a.m. to 7:00 p.m.